While the company has been talking about plans to build more vehicle factories in Europe and China, Tesla’s Fremont factory remains its only full-fledged car manufacturing facility. Company officials have always referred to the Fremont plant’s total capacity to be around 500,000 cars per year once optimized, which is what Toyota and GM were producing when they owned the factory, until now. During the conference call with financial analysts, Musk said that he sees a path to Tesla producing up to 1 million cars per year in Fremont – more than twice what Toyota and GM were producing. Fremont is manufacturing the vehicles and the Gigafactory in Nevada is manufacturing the battery packs. Although Tesla may not try to get Fremont up to 1 million cars per year, it could mean that the company is at least going over the previously stated goal of 500,000 cars per year once optimized. It might have been the first time that a Tesla official referred to Fremont factory’s capacity as more than 500,000 units per year, though right after the interview, a Tesla spokesperson told us that “600,000 per year” was a mistake and that “there has been no change” to the factory’s planned capacity. Based on Musk’s comments yesterday, it doesn’t seem too far-fetched to think Tesla is planning for the Fremont plant to have an output greater than 600,000 units per year. The Fremont factory is one of the biggest buildings on earth with 5.3 million square feet of manufacturing and office space. While it was the same size when Toyota and GM were producing 500,000 vehicles, Tesla has been acquiring space in other locations close to the factory to expand its operations, including the former Solyndra manufacturing building (500,000 sq-ft), another building on Kato Road in Fremont (300,000 sq-ft) and the Lathrop facility. Tesla also recently signed a lease for two new buildings in the Bay Area, adding a total of over 1 million square feet of production or warehouse space in the region. 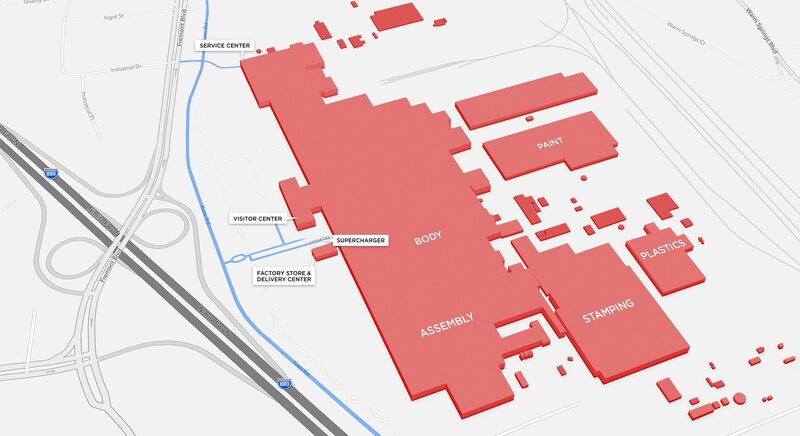 Tesla could potentially use all this space to move some of its operations from the Fremont factory and focus on the core components and assembly in order to get to 1 million vehicles a year. Additionally, Tesla is set to go on a hiring spree this weekend to hire “hundreds” of “production assembly associates” at a “massive” job fair in Fremont, California, according to job listings.